BLEEDING SKULL: The Wit And Whimsy Of ’80s Trash-Horror – Schlockmania! Schlockmania has said it before but it bears repeating: there was never a stranger decade for the horror film than the 1980’s. The VHS-driven home video revolution of this era created a demand for product that inspired an array of people who would have never dreamed of making films otherwise to start making their own homegrown epics. It was inevitable that the craziest outsider-artists in that bunch flocked to the ever-marketable climes of the horror genre, which was enjoying one of its periodic commercial peaks. Those untutored and unhinged filmmakers spewed out a wave of eccentric, gleefully deranged rotgut that fans and critics are still struggling to come to terms with. That’s where Bleeding Skull comes in. This reviewing partnership between Joseph Ziemba and Dan Budnik began as a website that offers critiques of the vintage VHS horror tapes that the two collect. It became a favorite with genre fans, prompting Ziemba and Budnik to create a book-length compendium of reviews recently released by Headpress. The result successfully distills the site’s essence into a encyclopedia-style format that is fun to flip through, educational and frequently brain-scrambling (in a good way). 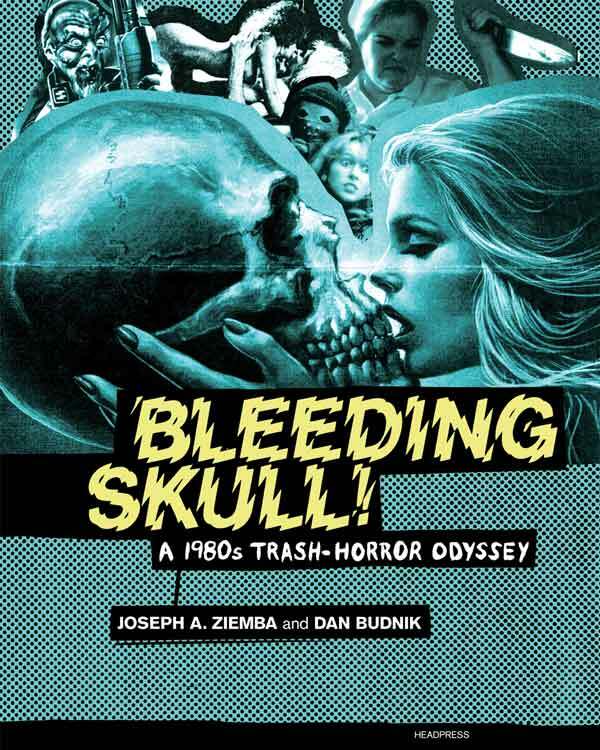 The trade paperback version of Bleeding Skull is subtitled “A 1980’s Trash-Horror Odyssey,” which cues you in to the project’s ground rules. For the purposes of this book, they have limited their journey to lesser-known horror fare either produced or released during the ’80s. However, a flip through the pages reveals this is not a limitation and more a way to give the book a very specific focus. Bleeding Skull bypasses big budget horror fare and name-brand indies so it can devote time to the kind of films that once occupied the dustier shelves of your local video store’s horror section. A flip through the book’s pages will reveal a collector’s level of knowledge about this stuff: the authors can wax eloquent on the historical importance of Boarding House, Sledgehammer, Blood Cult and Video Violence to the development of shot-on-video horror or discuss casual misogyny as a theme in the work of direct-to-video filmmaker Jeff Hathcock. Anyone who has delved into this twilight area of horror will be impressed by their ability to reference and cross-reference the kind of films and filmmakers that few critics pay any attention to. However, Bleeding Skull never allow the proceedings to get too dry. Both authors bring a deadpan wit to their work, copping to their inherent humor in discussing these films and their many foibles without ever condescending to the task. In fact, they often show an unexpected but welcome sense of whimsy in these reviews: Budnik’s review of Final Exam is framed by a scenario where he fantasizes about being friends with the film’s characters and Ziemba’s review of Shadows Run Black discusses how the presence of cocaine in a slasher flick guarantees that it will be entertaining. The authors have a lot of fun with their work and these touches communicates the fun of their trash horror hobby. It’s also worth noting the personal touch that Ziemba and Budnik bring to these reviews, something reflected in their differing yet complimentary writing styles. Ziemba’s approach has a quirky intellectual bent – he throws in the occasional reference to Chantal Akerman or Robert Altman – and he also brings in some personal anecdotes, like how Slumber Party Massacre brings back fond memories of a goddess-like clique of girls from his high school days. Budnik is more direct, doing his all to bring the viewer into the experience of watching the film: his review of Witchery breaks down the different attributes that make the film feel like you’re watching something from an alternate Earth while the review of the 1981 minimalist slasher Scream discusses how the constant slow movement of the camerawork gives the film an eerieness he finds addictive. He shares an off-the-wall wit with Ziemba that unites their styles and reflects the anything-goes ethos of the throwaway films they’re reviewing. In short, Bleeding Skull is worthwhile to the cult movie buff on a few different levels. For starters, it’s a fun yet insightful primer on an era of horror that’s often ignored by a lot of horror critics. Better yet, it is written in a style that will help the layman understand why these films are so interesting to the adventurous horror/exploitation fan. Part of the fun in watching movies that break all the cinematic rules is that it frees you up to use your own imagination in how you read their eccentricities. Bleeding Skull offers a beautiful example of how this can be done and might inspire you to have your own outsider-cinema adventures. Next ArticleNIGHT OF THE DEMONS (1988): A Party Movie For The Unholy?